Formula One chief Bernie Ecclestone said there is "no way" Lewis Hamilton will be docked points whatever the outcome of the Ferrari-McLaren spy row. McLaren have suspended one of their design team following claims a senior member of staff illegally received information from their arch-rivals. 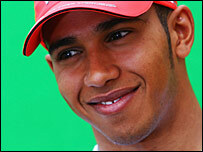 Ecclestone said it was possible McLaren could be docked points but that British star Hamilton would be unaffected. "It is nothing to do with the driver," Ecclestone told the Times newspaper. Motor racing's governing body, the FIA, are due to launch an investigation into allegations Ferrari engineer Nigel Stepney leaked design secrets to McLaren's chief designer Mike Coughlan. But Ecclestone stressed that while the teams, if found to have breached the rules, could lose points in the constructors championship, Hamilton's tally will be unaffected. "They (FIA) have got to prove that if any information was given by Ferrari, it was used," he said. "And if it was used, did it affect in any way the performance of the car, and if so where? "In that case, they could take away constructors' points from the team. But there is no way it would affect the driver." McLaren announced on Wednesday they had suspended a "senior member" of their design team after learning he had "personally received technical information from a Ferrari employee". The team insisted that it had not benefited from the information and said it had asked the FIA to conduct a review into the affair. Hamilton, 22, leads the championship standings by 14 points in his rookie season after making the podium in all eight races so far. He has two victories to his name and will look to cement his advantage at the British Grand Prix at Silverstone this weekend. McLaren team-mate and double world champion Fernando Alonso lies second in the standings, with Ferrari duo Felipe Massa and Kimi Raikkonen close behind in third and fourth.